This volume represents the culmination of an extensive research project that studied the development of linguistic form/function relations in narrative discourse. It is unique in the extent of data which it analyzes--more than 250 texts from children and adults speaking five different languages--and in its crosslinguistic, typological focus. It is the first book to address the issue of how the structural properties and rhetorical preferences of different native languages--English, German, Spanish, Hebrew, and Turkish--impinge on narrative abilities across different phases of development. 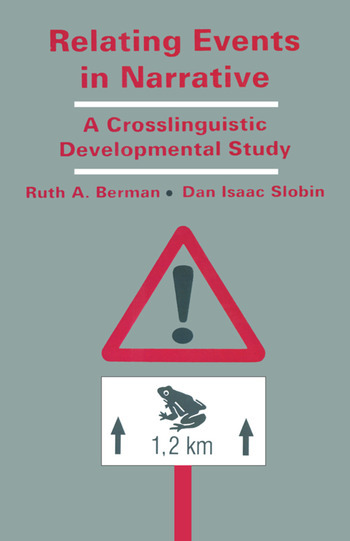 The work of Berman and Slobin and their colleagues provides insight into the interplay between shared, possibly universal, patterns in the developing ability to create well-constructed, globally organized narratives among preschoolers from three years of age compared with school children and adults, contrasted against the impact of typological and rhetorical features of particular native languages on how speakers express these abilities in the process of "relating events in narrative." This volume also makes a special contribution to the field of language acquisition and development by providing detailed analyses of how linguistic forms come to be used in the service of narrative functions, such as the expression of temporal relations of simultaneity and retrospection, perspective-taking on events, and textual connectivity. To present this information, the authors prepared in-depth analyses of a wide range of linguistic systems, including tense-aspect marking, passive and middle voice, locative and directional predications, connectivity markers, null subjects, and relative clause constructions. In contrast to most work in the field of language acquisition, this book focuses on developments in the use of these early forms in extended discourse--beyond the initial phase of early language development. The book offers a pioneering approach to the interactions between form and function in the development and use of language, from a typological linguistic perspective. The study is based on a large crosslinguistic corpus of narratives, elicited from preschool, school-age, and adult subjects. All of the narratives were elicited by the same picture storybook,Frog, Where Are You?, by Mercer Mayer. (An appendix lists related studies using the same storybook in 50 languages.) The findings illuminate both universal and language-specific patterns of development, providing new insights into questions of language and thought. Contents: R.A. Berman, D.I. Slobin, Preface. Part I:Introduction. R.A. Berman, D.I. Slobin, Different Ways of Relating Events: Introduction to the Study. R.A. Berman, D.I. Slobin, Research Goals and Procedures. Part II:Development of Functions. R.A. Berman, D.I. Slobin, Narrative Structure. T. Trabasso, P. Rodkin, Knowledge of Goal/Plans: A Conceptual Basis for Narrating Frog, Where Are You? Part III:Development of Linguistic Forms. R.A. Berman, D.I. Slobin, Overview of the Linguistic Forms in the Frog Stories. R.A. Berman, D.I. Slobin, Development of Linguistic Forms: English. M. Bamberg, Development of Linguistic Forms: German. E. Sebastián, D.I. Slobin, Development of Linguistic Forms: Spanish. R.A. Berman, Y. Neeman, Development of Linguistic Forms: Hebrew. A.A. Aksu-Koç, Development of Linguistic Forms: Turkish. Part IV:Development of Form-Function Relations. R.A. Berman, D.I. Slobin, Form-Function Relations in the Development of Narrative. A.A. Aksu-Koç, C. von Stutterheim, Temporal Relations in Narrative: Simultaneity. L. Dasinger, C. Toupin, The Development of Relative Clause Functions in Narrative. R.A. Berman, D.I. Slobin, Filtering and Packaging in Narrative. M. Bamberg, V. Marchman, Foreshadowing and Wrapping Up in Narrative. Part V:Conclusions. R.A. Berman, D.I. Slobin, Implications. R.A. Berman, D.I. Slobin, Becoming a Proficient Speaker. R.A. Berman, D.I. Slobin, Becoming a Native Speaker. Appendices: M. Mayer, Pictures: Frog, Where Are You? R.A. Berman, D.I. Slobin, Glossing and Transcription Conventions. R.A. Berman, D.I. Slobin, Research Using Frog, Where Are You? "This book has been long awaited by students of narrative development, child language acquisition, and cross-linguistic comparisons of language development....an important resource for anyone who wants to study or understand narrative (form and function)....This book constitutes a fundamental and important piece of work. All the authors are to be congratulated." "Focusing on crosslinguistic and typological aspects, this volume is a pioneering work that painstakingly addresses the issues of how the structural properties and rhetorical preferences of different native languages have an effect on narrative discourse abilities across different stages of language/narrative development." "It is a book full of attention to linguistic forms, but written not only for linguists. Its importance comes from the rich and detailed data, and the distinction between what is age-specific--cognitive and communicative side of narrative activity, understanding of ample hierarchies of events--and what is language-specific in narrative activity." "This book is therefore of great value for anyone with a professional interest in a more detailed treatment of how linguistic conventions are acquired in different language communities and how the particular features of their language uniquely contribute to this process." "This book represents a major achievement by the two editors and it reflects the depth and breadth of experience in developmental crosslinguistic research for which they are both so well-known....the book clearly and convincingly demonstrates an increase in the complexity of 'narrative packaging' as children develop. This is, of course, relatively well known, but this book supports and extends this with a wealth of rich detail, crosslinguistic range and insight....I have no doubt that this is one of the most useful and informative books on the development of narrative structure to have appeared in a very long time."